Marketing Strategy Musings - Strategy Dude (Edmund Wong's blog): Is Amazon Getting Too Aggressive With Speedy Shipping? Is Amazon Getting Too Aggressive With Speedy Shipping? We've all heard about Amazon's ambitions to leverage drones for faster and cheaper package delivery. 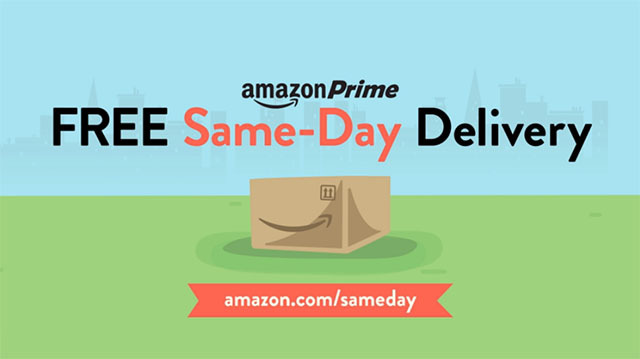 But while that may be 1-2 years away, I've recently noticed Amazon really pushing same day delivery to Prime members. Here's what happened to me recently. I was browsing on my Amazon app at 7:30am one morning. I was just researching something and wasn't really planning to buy it during this session. However, as I was reading the reviews on one product I was considering, I saw a note: Buy in the next 1 hour 39 minutes and get it the same day by 9pm. And it would be free as I am a Prime member. Wow, I couldn't believe it! So I bought it and was cautiously optimistic. From a supply chain management perspective, I was so intrigued by how Amazon could be so confident they could pull this off. First, I thought they must look at my default shipping address, checking to see the nearest warehouse the item I was looking at would come from. Then, quickly check to see if there are planned deliveries near my house from that warehouse. Lastly, if all this works out, they see I'm a Prime member and this special shipping over is served up. All this has to happen in seconds because I saw the same day shipping offer when I initially pulled up that product page. So, that means it takes lightning fast back-end logic to make this user experience sooooooo seamless, like magic! Later that day at 4:24pm, Amazon informed me the item was shipped and would arrive by 9pm. I was getting excited. But 9pm came and went, and nothing. At 10pm, I was notified about a delay. But it wasn't just a one day delay. Instead it gave me a range of 1-3 days! What? That's worse than if I stuck with regular 2-day Prime shipping in my original order! How can Amazon have such imprecision for shipping, given the advanced logistics they are known for? What's worse in this case was it actually came after the usual 2-day Prime shipping! And once it was delayed, Amazon no longer provided up to the minute tracking as if the package was in some unknown limbo. It just said if you don't get it in 4 days, come back for more options. What a horrible user experience! One consolation prize came out of this at least. As a Prime member, I contacted Amazon about this delay in guaranteed delivery and I got an extra month added to my Prime Membership, roughly an $8 value. But I ask: Is Amazon setting the bar too high for itself with such aggressive shipping promises?